On average, kids consume snacks three times a day with 27% of their daily calories coming from all those between-meal nibbles. 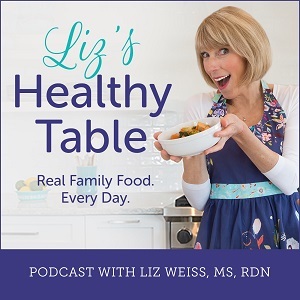 When children are offered things like fruits, vegetables, whole grains, and calcium-rich yogurt, snack time provides the perfect opportunity for exposing them to new tastes, textures, and the nutrients that may be missing from their diets. Swap salty chips, candy, and sugar-sweetened beverages for foods that bring good nutrition to a child’s day. Think of snacks as nutritious mini meals that stave off hunger without ruining appetites. I can’t recall a day when my kids came home from school and announced, “I’m not hungry.” Quite the contrary! Kids are usually famished when they get off the school bus or the soccer field, which is actually a win-win for parents, since hungry kids are more likely to gobble up whatever is placed in front of them. 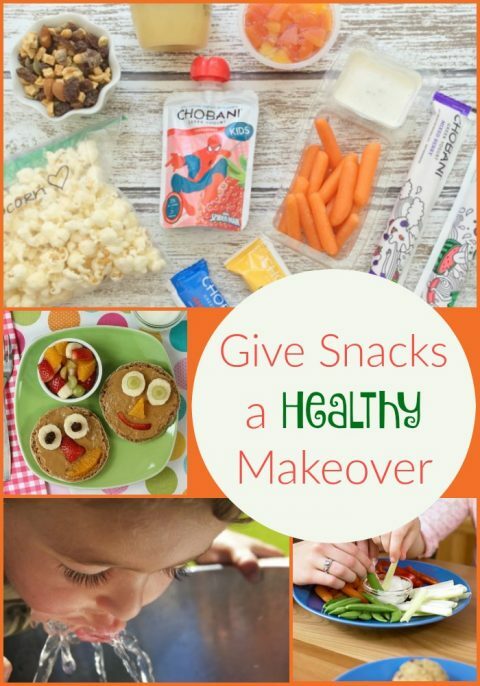 The 5 simple snack makeover strategies below should get you well on your way to giving your family a healthy snack makeover. Now is the time to establish good eating habits, and the right kinds of snacks can help you achieve that goal. 1. 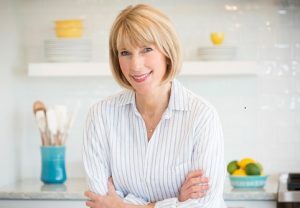 Choose Convenience Snacks Wisely: Get away from heavily processed snack foods made with ingredients that bring sodium, saturated fat, and little to no nutrition to the diet, and instead, look for grab-and-go snacks brimming with good nutrition. 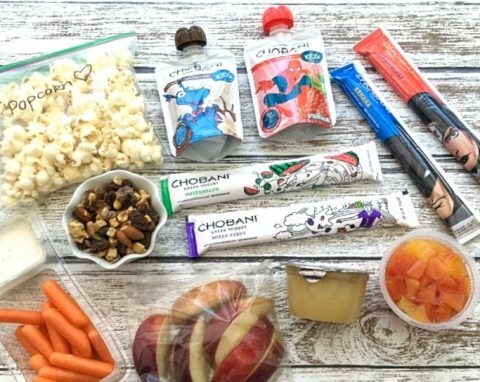 Some of my go-to recommendations include unsweetened mini applesauce and fruit cups, whole grain popcorn (for kids 5 years or older), baby carrots and celery sticks with dip, mini hummus cups, sweet potato chips, and mini yogurts like Chobani Kids® Greek Yogurt Pouches and Tubes. They’re made with only natural ingredients blended with low-fat milk, and they have 25% less sugar and twice the amount of protein compared to the leading kids’ yogurt. You can freeze the yogurt tubes and then pack ’em in a lunchbox or serve up after school. I created this blog content in partnership with Chobani Kids® Greek Yogurt Pouches and Tubes. I was compensated for my work, and as always, all opinions are my own. 2. Add Kid Appeal to Fruits and Vegetables: Bring fun and whimsy to fruits and veggies to entice kids to eat them. 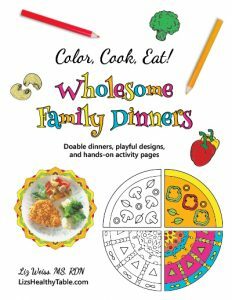 Serve up a veggie platter filled with bell pepper strips, baby carrots, and cucumber wheels with a delicious yogurt-based dip, guacamole, or hummus for dipping. 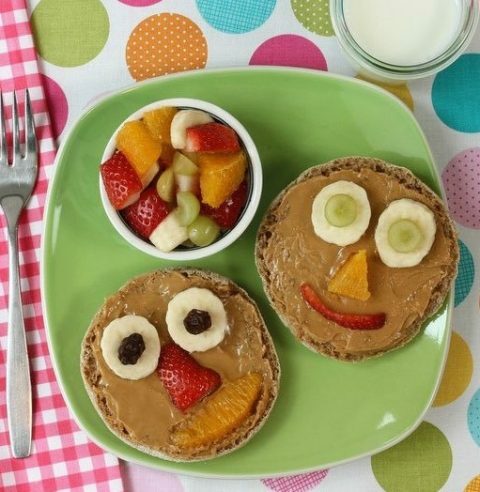 Get silly with fruit by serving berries, melon, and grape halves kebab style on frilly toothpicks or make my Peanut Butter Smiley Faces with whole wheat English muffins, peanut butter, and cut up fruit. 3. 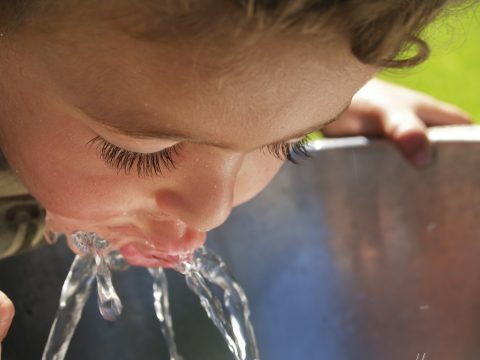 Be a Smart Slurper: Avoid sugar-sweetened juice “drinks,” soft drinks, and sports drinks. They’re filled with added sugar and bring little to no nutritional value to the diet. Stick to water, low-fat milk, and 100% fruit juice. But keep juice to a minimum. The Academy of Pediatrics recommends a limit of 4 to 6 ounces for children ages 1 to 6 and 8 to 12 ounces for older kids, ages 7 to 18. 4. Fill in Nutrient Gaps with Healthy Snacks: Take a look at your child’s diet and identify what’s missing. Not getting enough calcium? Turn to yogurt snacks like Chobani Kids® Greek Yogurt Pouches and Tubes. 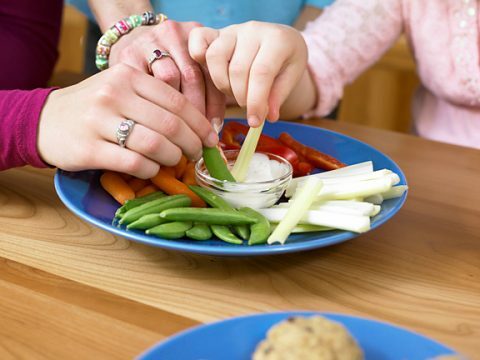 Does your child need more fiber to help promote regular bowel habits? Choose fruits, vegetables, whole grains, beans, nuts, and seeds. 5. 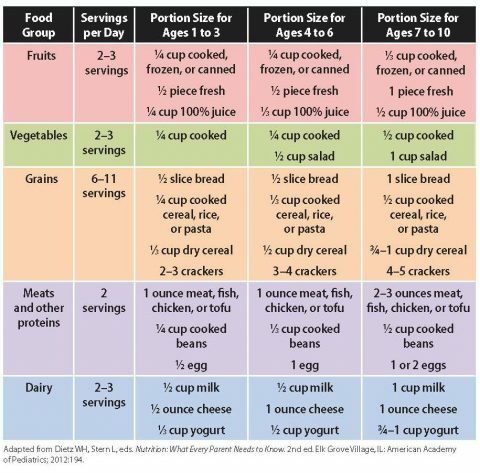 Watch Portion Sizes: Serve kid-size snack portions (see chart above) to stave off hunger without ruining your child’s appetite for their next meal. Bear in mind that serving sizes have increased over the years. For example, 20 years ago a bagel was 3 inches in diameter and provided 140 calories. Now, the standard is a 6-inch bagel with 350 calories. For young ones it may be that a quarter or a half of a whole wheat bagel or a mini whole wheat bagel is an appropriate portion. What are some of your go-to snack foods for kids? How do you fill in the nutritional gaps in their day? 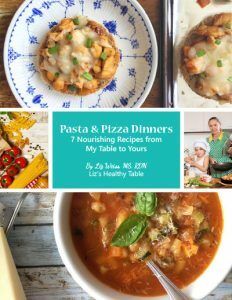 Great tips Liz and Janice! My kids love the Chobani tubes and pouches – the tubes are especially great frozen as an alternative to ice cream on those hot summer days. My girls also love nuts, veggies and hummus, cheese sticks, and air popped popcorn with some seasoning! Great tips! I’m glad you added the graphic about servings and portion sizes for each food group for the different ages. This is a great resource!